Stanley Robinson moved to Kimbolton in 1903, aged 3. He left school at 13 and went to work in a Cycle Shop near Trafalgar Square, London. He joined the Royal Flying Corps in1916. He trained as an observer but counted himself lucky not to have seen much active service due to an injury sustained in training. After the war Stanley and a friend took on a contract to salvage hundreds of military vehicles that were caught in floods in Yugoslavia. 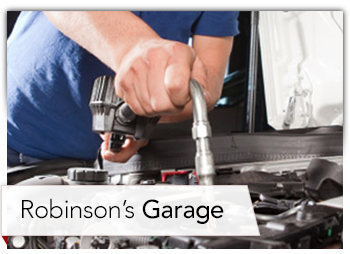 In 1927 he started S V Robinson’s Garage in the corner of the present site, repairing Cars and Cycles. In 1936 he built the first stage of the current Garage Building. 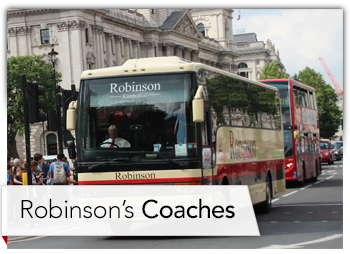 Business prospered and a taxi and coach were added to the business. In the 1950’s Stanley’s Son, Colin, joined the business straight from National Service. He developed the Sales, Service and Parts departments as the company was now Agents for Austin and Morris Cars. The car dealership developed through BMC, British Leyland, Austin Rover and finally Rover. In 1960 the Garage was extended with the addition of a car showroom and coach repair workshop. Colin’s son, Charles, joined the business from School in 1977. Through the 80’s the Dealership thrived and the Coach business grew in line with increased local demand. In the mid 90’s Rover folded and Robinsons continued selling used car for another few years. By the millennium car sales had finished and business was focussed on Coaches and Garage service. The fuel forecourt was closed late in 2013 as part of major refurbishments to the whole site. 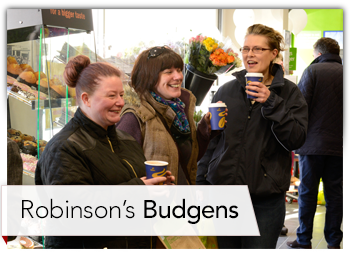 In 2014 Robinson’s Budgens of Kimbolton was opened. The food store had a great opening and continues to build on this initial success. The Garage and Coaches continue supplying quality service and value to a wide range of customers.